soup is sooo good, and it has wine and brandy in it (the alcohol content cooks out of course). But the wine is nice to have with dinner. 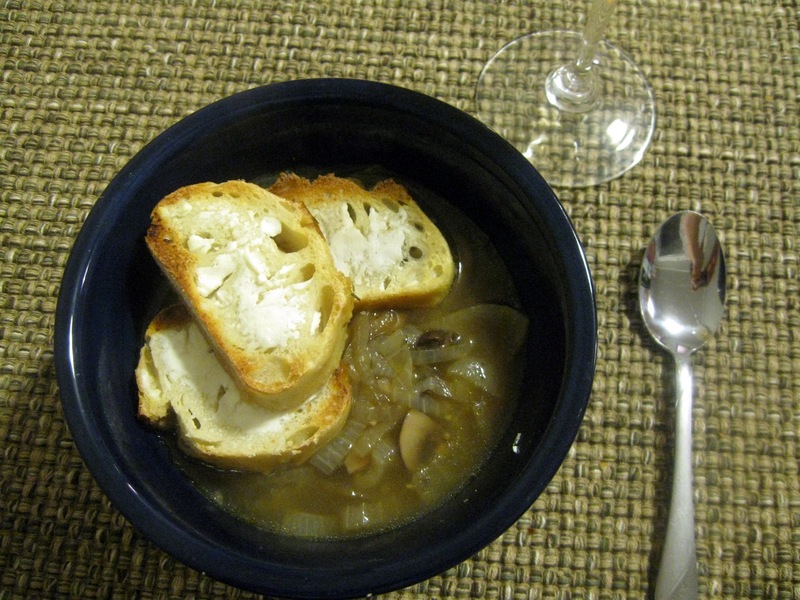 I've never had goat cheese on onion soup but it's a really delicious addition. I would add more goat cheese on the bread before toasting because I think it would make it even more delicious than it already is. If you've ever made homemade French Onion soup you understand the value of caramelized onions and the time it takes. If I can I will let them sit in the pan on low for hours and hours, maybe 3 or 4 or more. It will give them the lovely golden brown color and nice slightly sweet taste before anything else is even added. 1. Melt 1 tablespoon butter in heavy large pot over high heat. Add onions and thyme; sauté until onions begin to soften, about 8 minutes. 2. Reduce heat to low; cook until onions are caramelized, stirring occasionally, about 20 minutes. Transfer onion mixture to medium bowl. 3. Melt remaining 1 tablespoon butter in same pot over medium-high heat. Add mushrooms; sauté until soft, about 12 minutes. Add Cognac and garlic; stir 20 seconds. 4. Stir in onion mixture, then broth and wine. Bring to boil. Reduce heat to low; simmer until onions are very tender, about 45 minutes. 6. Preheat broiler. Place baguette slices on large baking sheet. Spread goat cheese on baguette slices, dividing equally. 7. Broil goat cheese croutons until cheese begins to brown in spots, about 30 seconds. Divide soup among 6 bowls. Top with croutons and serve.